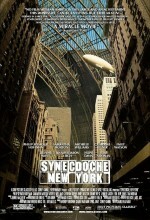 A - Screenwriter Charlie Kaufman's directorial debut, the maddening, devastating Synecdoche, New York, wanders in the twilight world usually reserved for the bleakest of existential novels. It reflects a disquieting comfort with the folding of reality and mind within the dark whorls of creative frenzy, as well as a gluttony for morbidity that borders on the obscene. This is a film that has no use for reason. However, its nightmarish illogic is so powerfully rendered and so robustly intuitive that it demands our attention, devours it even. With Synecdoche, Kaufman has created his densest and most sublime film to date, striking a dizzying balance between conventional romantic tragedy and unabashedly grave philosophical conundrums. This film has perplexed me, but I cannot stop marveling at it. Much like Tarsem Singh's phantasmagorical hymn to storytelling, The Fall, Synecdoche hums with the electricity of a novel form of cinematic life, a grand work teetering on folly. It must be seen to be believed. When a MacArthur genius grant improbably arrives in Caden's lap, he envisions an epic work of original theater, something "true." (Are unknown Schenectady theater directors typically so honored?) He rents an enormous warehouse--a hanger, really--in New York City and begins to assemble his magnum opus. His cast includes dozens of actors at first, then hundreds, then thousands. Within the warehouse a colossal set takes shape, an artificial city. Months of development turn into years. Caden's vast production begins to encompass events from his own life, eventually boasting recreations of scenes that we have already witnessed. To play himself, Caden casts Sammy (Tom Noonan), an actor who has been stalking him for two decades. Sammy is an eager study who follows Caden everywhere and dutifully notes the color of his stool. (This isn't as outlandish as it sounds, as Caden himself is fixated on his excreta.) Meanwhile, Adele and Olive have disappeared into the avant-garde German art scene, where Caden's attempts to communicate with his daughter--now a tattooed muse under the wing of a female lover (Jennifer Jason Leigh)--are cruelly rebuffed. I could go on forever recounting the swollen details of Synecdoche's essentially baffling story, but to do so would not convey the addictive sense of the unmoored that Kaufman sculpts. He conjures an aura of demented connection and significance that can only be described as dream-like, treading the paths of Cronenberg at his most determinedly surreal (e.g. Naked Lunch) or Lynch on any given night. Synecdoche recalls Kaufman's own Being John Malkovich in its taste for hallucinatory desperation and outrageous metaphor. The latter doesn't always succeed as well a Kaufman imagines. Late in the film, Hoffman speaks to his grown daughter by means of an electronic translator, as she only understands German. Get it? They don't speak the same language anymore. This sort of daft literalism preoccupies Kaufman to the point of distraction, but it never truly irritates, perhaps because his performers are so absorbed into the film's fabric of uncanny gloom. There is no winking acknowledgment of Synecdoche's silliness or strangeness. This is part of the film's curious magic: Its ability to convey absolute sincerity while giggling madly. Synecdoche's fascination with identity and Möbius narrative echoes not only Lynch's late masterworks, but also Polanski's The Tenant. The whole world seems to conspire in the utter disintegration of Caden Cotard. Kaufman suggests that Caden creates art not for the benefit of others but in order to unlock the mystery of his own life. However, even the play eventually turns on him. Sammy casts another "Sammy" in a play within the play, as well as other "Hazels," and everyone becomes confused about their role in the production (read: universe). Family members and strangers call Caden's sexuality and gender into question, and when he casts an actress (Dianne Wiest) in a pivotal role, the two seem to switch places. Time and place roil and ooze together, with Olive's childhood diary seeming to prophecy the future and New York blending into Germany blending into Fake New York. Eventually, Caden notices a map of his set showing a series of warehouses, nested like matryoshka dolls: Warehouse 1 contains Warehouse 2 contains Warehouse 3 contains... How far down does it go? Does this fractal-reality provide illumination somewhere within its depths, or is it obfuscating Caden's understanding of his nature? Is the play itself a hallucination or deathbed fugue, an attempt by a lucid dreamer to organize his desires and fears? Kaufman doesn't provide a definitive answer. However, in Synecdoche's final scenes he suggests that our path might be scripted and end in ashes, but the final enlightenment is no less potent and no less sweet.